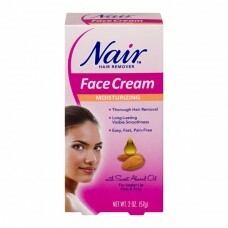 Nair™ Hair Remover Face Cream Moisturizing. Thorough hair removal. Long-lasting visible smoothness. Easy, fast, pain-free. With sweet almond oil. For upper lip chin & face. Not tested on animals. *Among depilatory products. #1 Hair removal brand*. Nair face cream removes hair below the skin's surface while moisturizing and exfoliating above. In just minutes, achieve beautiful skin that lasts. For all hair types. Smooth, radiant skin. Thorough hair removal. Nair is a trademark of Church & Dwight Co., Inc. Questions? Comments? 1-800-248-8820 M-F 9AM-5PM ET. www.nairlikeneverbefore.com. ©2005. Read the warning section before use. Product can be used on upper lip, chin and cheek. To apply cream: Remove all makeup. Squeeze cream onto fingertips. Smooth on a thick, even layer to cover hair. Do not rub in. Wash your hands immediately after application. Leave the cream on for 5 minutes. Then check a small area for hair removal. Total hair removal depends on hair thickness. If the hair does not come off after 5 minutes, leave the cream on for a few minutes longer. Do not exceed 10 minutes of total application time. To remove cream and hair: Gently wipe off the cream and hair with a damp washcloth. Do not rub. Once all hair has been removed, rinse skin thoroughly with lukewarm water. Pat dry. Keep bottle tightly closed between uses.